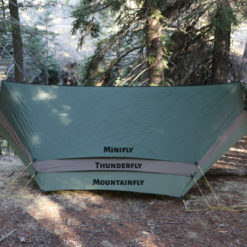 We’re happy to introduce the MountainFly as one of our newest tarp designs. 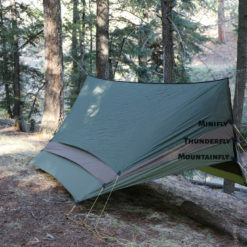 Being a slightly larger version of the popular Thunderfly, this tarp is built for those that want the simplicity and convenience of a standard hex tarp but with extra end-coverage when the weather gets nasty. 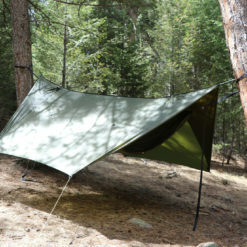 We’ve taken the standard hex tarp and given it major end-coverage that can be deployed as needed by adding a split-beak (small doors) to the ends that can be clipped together and deployed with a single guyline to add a significant amount of end protection right where you need it (higher up near the ends of the hammock where a standard hex shape offers the least coverage). When the weather is nice these small doors simply stay clipped back and out of the way until you need to deploy them. Once deployed, they protect the hammock from windblown rain coming in from the ends of the tarp. Available in green or brown in either 20d polyester or 30d nylon, or in 30d polyester Bushwack camo. 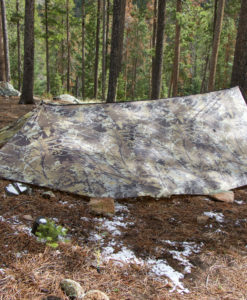 We are currently offering tarps in both Polyester and Nylon options (camo print available in Polyester ONLY). The Polyester fabric is more stretch resistant and has lower water absorption, while the Nylon is a stronger more durable fabric. Both are good options, weights are similar for each. Both fabrics have a minimum 2000mm hydrostatic head waterproof rating. Be sure to check out the extra options and modifications available in our Custom Tarp Builder section. NOTE: “tieouts” refers to the guyline attachment points, not the guyline itself which is not included. Tent stakes and guyline sold separately in our accessories section. 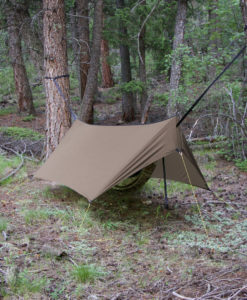 What length Tarp is best for a Ridgerunner? 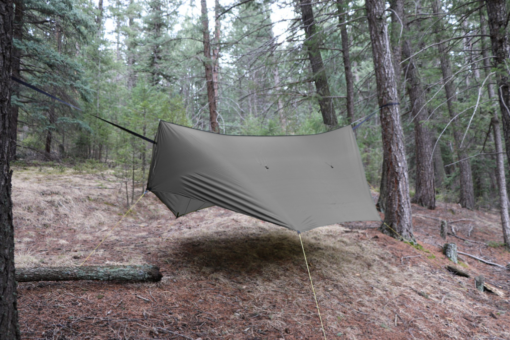 So on an 11′ end-gathered style hammock, an 11′ tarp will give more coverage down low than 13′ would. 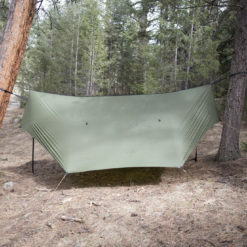 But on our Ridgerunner bridge hammock, there is no ridgeline and the hammock is usually hung a little flatter…so you can get a 13′ tarp to come down for sufficient side coverage. The 13′ also allows the doors to fully shut on the Ridgerunner, the shorter 11′ tarp is also appropriate for a Ridgerunner but the apex of the RR’s suspension triangle will poke out between the doors, creating a small opening. 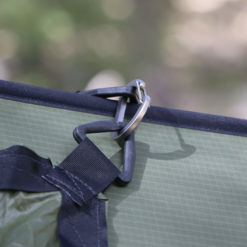 Bumping to a 13′ eliminates that issue, but is not necessary… the opening is a narrow vertical slot that is about 3 feet beyond the ends of the hammock fabric. There is a photo of the RR suspension triangle poking through the door slot in the gallery on the Thunderfly page for reference. 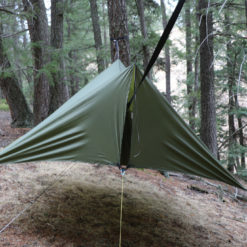 What's a good lightweight tarp option? 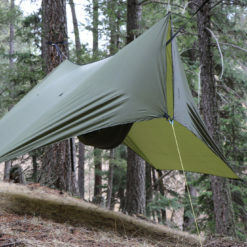 Which tarp do you recommend? 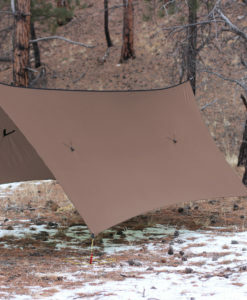 The Superfly is our best selling model because it is our “all season/all weather” tarp model. The main reason someone might select a different model tarp would be if they want to save pack weight in the warmer months when the Superlfy coverage is overkill for the conditions and weight savings is more desirable. Other than a little extra weight, there is no real downside to using the Superfly in warmer conditions. For information on choosing the right tarp for you, see our Tarps 101 page. 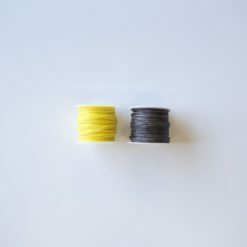 What is the difference between 20d Silpoly and 30d Silnylon and which one do you recommend? The 30D Silnylon is slightly more durable than 20D Silpoly. In general nylon has a higher tear and tensile(breaking) strength than the same weight polyester simply because nylon is all-around stronger pound for pound than polyester is. Poly will stretch less (when soaked or otherwise) and it will absorb less water weight. Poly still stretches some, just not as much as nylon. 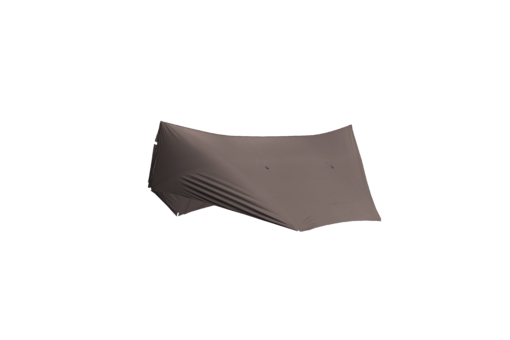 The extra stretch of nylon adds to it’s strength though, in that it acts as a built in shock absorber during a heavy wind gust, so with poly stretching less in that situation, in theory the nylon tarp would have a lower wind load due to extra stretch. We’ve had excellent long term durability results from our 30d Silnylon. Ploy is said to have better UV resistance, but don’t think you can treat your tarp any differently than before, we tested a polyester tarp outside for about 2 months and the fabric lost ALOT of strength from the sun exposure, so you still want to avoid things like that regardless of whether your tarp is poly or nylon. 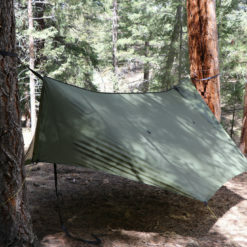 Does an 11' tarp work with an 11' Hammock? 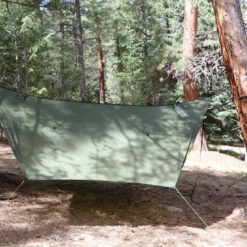 Our 11 foot hammocks have a ridgeline length of 112″ (the body fabric hangs in an arc) so with an 11′ (132″) tarp this gives you 10″ of tarp overlap at each end of the hammock. If the tarp has doors then those doors will be able to shut or overlap enclosing you all the way around. How far down does the tarp come? 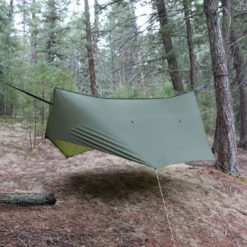 This depends on tarp width but also how high you hang it up above the hammock, hang it higher and it doesn’t come down as far . Your hammock suspension runs uphill at an angle and the tarp is longer than the hammock, so you can only pitch the tarp so low that it contacts the hammock suspension. So the longer the tarp length the higher you have to pitch it above the ridgeline of the hammock and the more coverage you lose down low. 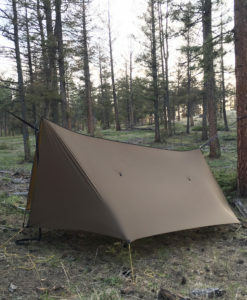 Generally go for the 11′ Fly series tarp with any of our 10′ or 11′ end gathered models like the Blackbird, XLC and Eldorado. This will give max windblock down low near the bottom of the hammock. What is included with the tarps? 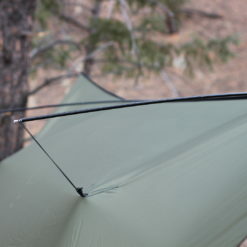 All of our tarp models come with a single-ended stuff sack included.Recommended items are listed on each tarp page. Great coverage for chameleon. Took out past weekend on Pine Mountain Trail in Georgia. Rained hard but nothing got in. I like the beaks. They are easily to deploy, easy to clip up and provide enough protection for me. Great tarp.